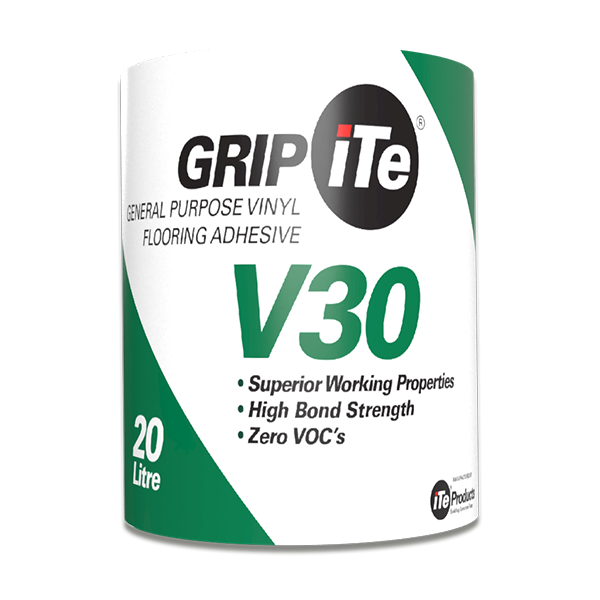 GRIPiTe V30 Vinyl Flooring and Carpeting Adhesive, is an excellent general purpose flooring adhesive with high bond strength, a hard glue line and moisture resistance when fully cured, and high performance properties. GRIPiTe V30 has anti-bacterial agents for dry film protection. Water-based, with no organic solvents, this adhesive is “green” and complies with all GBCSA requirements. We recommend that SANS 10070:2012 be complied with. Stored in a cool dry store, unopened BONDiTe® will last for 12 months. Safety goggles and gloves should be worn to protect the eyes and skin from accidental exposure. In the event of eye contamination, the eyes must immediately be washed out with copious amounts of clean water, and medical assistance sought. It is recommended that overalls be worn to minimise soiling of clothing. It is imperative to get adhesive transfer onto the back of the flooring. Use of a heavy 68kg roller on the flooring before the adhesive has set is required. Once the screed has been swept and vacuumed to remove dust, the adhesive is poured onto the floor and trowelled with the notched trowel, spreading the adhesive evenly over the surface, avoiding creating ponds. In order to prevent adhesive trowel marks to be visible once the adhesive has set under the flooring, the wet adhesive may be rolled with a mohair roller to flatten the ridges. The adhesive will change from a light creamy colour to transparent once it has flashed off sufficiently. This flash off time is normally about fifteen minutes. Once the adhesive has flashed off, the flooring should be laid into the adhesive, rubbing carefully to prevent air pockets from accumulating under the flooring and causing a bubble. Care must be taken to ensure that adhesive transfer takes place. Roll the floor with a 68KG Tri-Section roller to obtain optimum bond. Once the substrate has been swept clean to remove dust and dirt, the adhesive is poured onto the floor and trowelled with the notched trowel, spreading the adhesive evenly over the surface, avoiding creating ponds. In order to prevent adhesive trowel marks to be visible once the adhesive has set under the flooring, the wet adhesive may be rolled with a mohair roller to flatten the ridges. The adhesive on the roller must then be rolled onto the back of the flooring to create a two-way stick. The adhesive will change from a light creamy colour to transparent once it has flashed off sufficiently. This flash off time is normally about fifteen minutes. Given the non-porosity of the two surfaces, care must be taken to ensure that no volatiles are trapped between them. Once the adhesive has flashed off, the flooring should be laid into the adhesive, rubbing carefully to prevent air pockets from accumulating under the flooring and causing a bubble. The adhesive will change from a light creamy colour to transparent once it has flashed off sufficiently. This flash off time is longer than normal due to the cold conditions; refer to the flooring manufacturer’s guidelines regarding installation temperatures and enough time must be left to allow proper volatile evaporation. Given the non-porosity of the two surfaces, care must be taken to ensure that no volatiles are trapped between them. Once the adhesive has flashed off, the flooring should be laid into the adhesive, rubbing carefully to prevent air pockets from accumulating under the flooring and causing a bubble. Before it has set GRIPiTe®V30 can be washed off with soapy water. Once dry, thinners or similar will be effective. 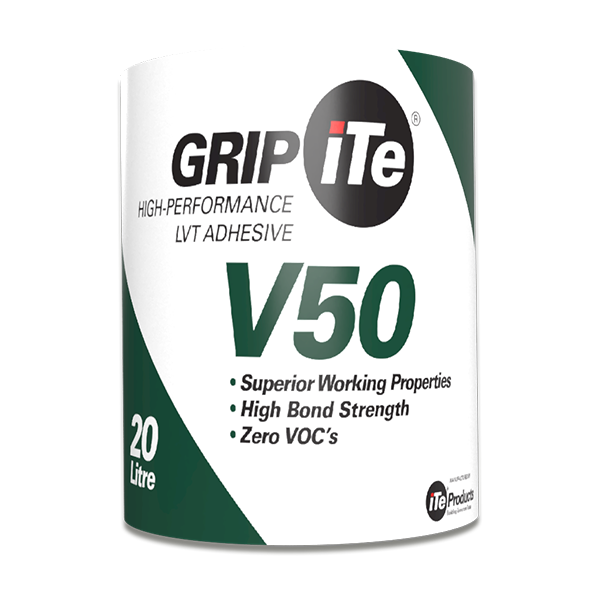 GRIPiTe®V30 is applied at a rate of 4 m² per Kg, depending on the porosity and roughness of the surface being adhered to and the trowel notch size. The recommended trowel notch sizes are 1,5mm “Veë’s” with 1,5mm intervals for vinyl, and 3mm “Vee’s” with 3mm intervals for carpets. Based on International standards, this equates to A2 and B1 notching. The A1 notching yields approximately 4m² per Kg, while the B1 notch yields approximately 3m² per Kg. 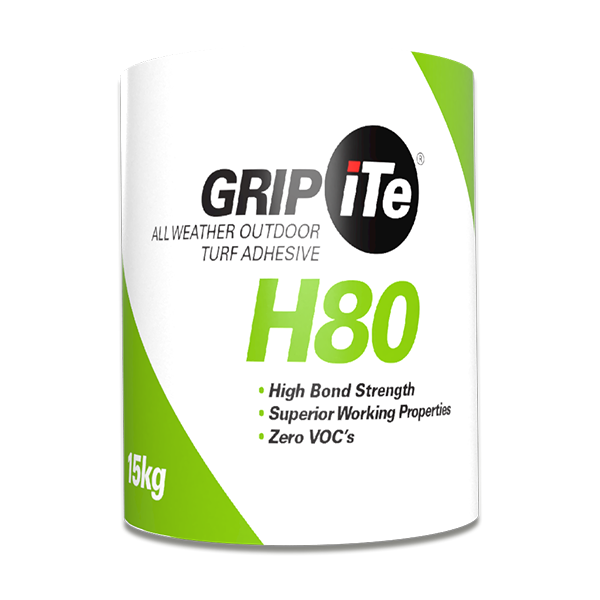 GRIPiTe®V30 is suitable to bond needle-punch carpeting, un-backed and backed, semi-flexible vinyl tiles, fully-flexible vinyl tiles and sheeting onto cement based and concrete screeds. It can be used to bond the above flooring to other substrates under certain conditions. (Obtain advice from our technical staff). 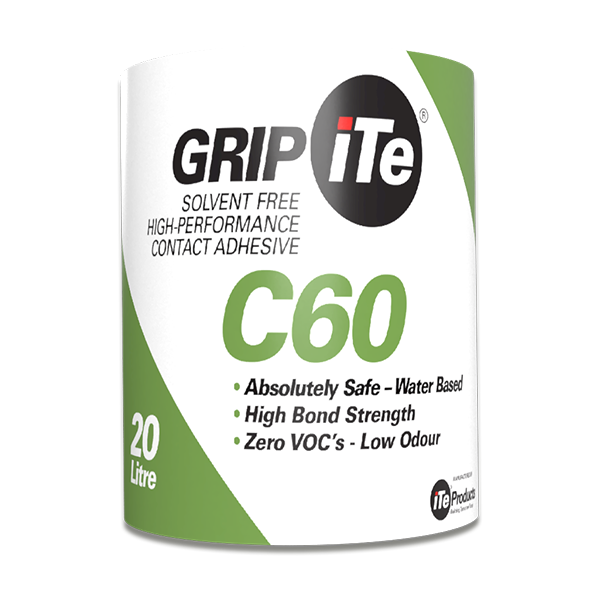 GRIPiTe®V30 is available in 5Kg and 20Kg plastic containers.